CintaNotes is a small but very handy application for taking and managing notes. It is ergonomic, unobtrusive, and feels like part of the system. Just select some text, press the hot key, and it is already in CintaNotes. It has a lighting fast as-you-type search and can synchronize notes with Simplenote for mobile access. Powerful hierarchic tagging system will help in organizing notes. A must-have tool for overcoming information overload! CintaNotes is an application for taking and managing notes and creating personal knowledge bases. It is ergonomic, unobtrusive, and feels like part of the system. Just select some text, press the hot key, and it is already in CintaNotes. It has a lightning fast as-you-type search and can synchronize notes with Simplenote for mobile access. The powerful hierarchic tagging system will help in organizing notes. Notebooks can be password-protected, and you even can create rules for automatic note categorization. This is a must-have tool for overcoming information overload! Giveaway of the Day. 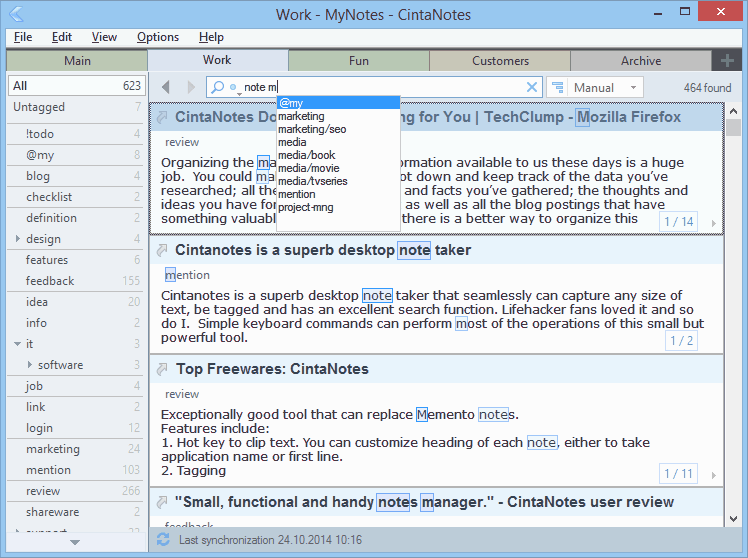 Cinta Notes Pro 3.7 - A small but very handy application for taking and managing notes.